As a dedicated and passionate educator, advocate, researcher, writer, counselor, supporter, encourager, and someone who has walked firsthand through the journey of dementias and Alzheimer’s Disease with a loved one who spends a lot of waking hours – as well as many hours when I should be sleeping – devoted to making sure there is no lack of practical and usable information and resources available to those who are currently going through or will be going through this journey with their loved ones, it can often seem, with very little tangible feedback (I know people are reading the blog), that I’m wasting my time and just talking to myself. But every time I start wondering “What’s the point? Nobody cares anyway.,” I remind myself that it’s worth it if only one other person on the planet obtains the help, the information, the encouragement, the empathy, or the “one person besides me gets this” they need. On the other hand, it is encouraging once in a while to have someone tell you that the work you’re doing is appreciated. It means as much to have a fellow blogger whose own work is appreciated to consider what you provide a source of inspiration. (None of us is in this for recognition and praise. We’re doing it because we’ve been there and we know what you’re dealing with if you’re there now or what all of those of you who will be dealing with dementias and Alzheimer’s Disease in the future will face. We know what it’s like to have no information, no support, no help, no nothing and to have to figure out on our own. Our efforts are to not waste the pain, but to pay it forward so that others don’t have to face what we faced. 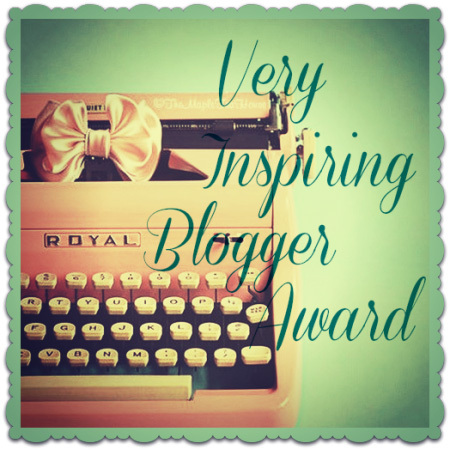 I was nominated for the “Very Inspiring Blog Award” by Kay Bransford who blogs in Dealing with Dementia about the journeys with her dad (now deceased) and her mom (living and progressing) through dementias and Alzheimer’s Disease. My parents were both in the medical field, and although I excelled in and loved the biological sciences (especially genetics), to my dad’s dismay, I didn’t choose the medical profession as my career. Armed with a humanities degree (with practical minors in math and accounting) and a concrete plan to start my career in technical writing, I morphed into a full and expansive career in information technology. My mom developed dementias (vascular and Lewy Body) and Alzheimer’s Disease right before my eyes, but I didn’t have the knowledge and the resources to put it all together until it was no longer undeniable. I don’t ever want there to be another person in the world who has to go through the rapid and, sometimes, hard catch up the way I did. Being able to provide hands-on, side-by-side care for my mom – and to walk beside and with her every step of the way to the end – was a gift from God for which I am thankful. I’d do it all over again in a heartbeat. I learned things about myself I needed to know as I walked the journey through dementias and Alzheimer’s Disease with my mom. I learned lessons that I could not have learned any other way. In the course of the journey – and beyond – I changed and am continuing to change for the better and matured and continue to mature into a kinder, gentler, more patient, more forbearing, more forgiving, more understanding, and more compassionate version of myself. Although I still have miles to go before I sleep, this much-needed and long-overdue upgrade, with its fixes, patches, and, in some cases, start-from-scratch recoding put me further down this road of change than I was when I started. God gave me the gift of being able to write. If there’s praise to be given, it belongs to Him. I am responsible for using this gift in a manner that is worthy of the One who gave it to me. To the best of my ability, I strive to do that with every word that I write wherever I write it. Thank you, Kay, for nominating me. I appreciate it, my friend and fellow traveler on the journey through dementias and Alzheimer’s Disease. Your personal facts 3-6 really resonate with me. Helping the elderly, family or friend, really changes a person for the better and what you get back is always more. Thank you for nominating me, Sandra. I look forward to reading and gaining knowledge from your blog as I help my family care for my mother-in-law in the later stages of Alzheimer’s and my continued friendship with my neighbor, Miss D as she goes through her journey with dementia. Thank you, Judy, for reading, for encouragement, for appreciation, and for sharing. Your consistency in this is something that I’m very grateful for. ❤ you. Thank you for these wonderful insights. I am 63 years old, work in Asset Management in South Africa and in the Exercise industry – on the go, super busy, very active. My husband began to exhibit strange symptoms quite some years aso. He was fully functional so I was the only one who noticed. In the past 3 years it has escalated. No doctor would diagnose him. In my novice research I headed towards Parkinsons Disease (PD) as a possibility. Neurologists would not confirm. After many winds and turns and zero assistance from the medical community he was diagosed with CBD – 10 times worse than PD. (This was 2 weeks ago). I am already exhausted, scared, resentful, sleep deprived and very, very alone and I suddenly face 6 – 8 years of the disease worsening way beyond this. At any time he could pass away from choking or pneumonia or such like. In the meantime he goes from being sparky, funny, humourous, caring to a selfish 2 year old. I am financially exhausted as well as everything else. His daughers have come through for me and said they want to help financially as they live on other continents and a physical presence is impossible. Until I read thisI thought I was a bad person for being so selfish and wanting a life of my own, to be “off duty” sometimes, feet up and read a good book sort of thing. A sleep that lasted more than 4 hours. A night out with my friends, a day at the beach with the dogs. But they are all gone. To capt it all, I was trying to help him into his wheelchair a week ago and he plopped down and threw me off balance. I landed hard and broke my hip. The next day I had a hip replacement. I am now trying to get back on my feet, heal, keep up with my work, and heed his demands. I now have Carers 24/7 and my costs have ballooned. I will be on crutches for 3 weeks, and 1 crutch for 3 weeks. My running (as litte as it was) is now off limits for ever so that I dont wear out my new hip (I may live to 90 – heaven forbid) (I also have a dog with severe epilepsy – I love him to bits and another who had to be put to sleep 3 weeks ago due to severe damage to his neck). I do feel that my efforts are unappreciated by my husband and that hurts so much. However I am so glad that others also feel the guilt, the tiredness, the fear. It is like belonging to a small unknown invisible community – silent support and bottomless empathy. That is what I need to hold on to. I am so sorry to hear about all the trials you and your husband are dealing with and my heart and prayers are with both of you (CBD is definitely a whole different battle in dementia). We are a community, those of us who care for our loved ones tirelessly, but humanly as well. It is helpful to know that all that stuff we wrestle with is the same thing that others wrestle with at times and that getting overwhelming and having mini-meltdowns is just part of the process. It doesn’t mean we’d do anything differently than make the choices we make to be there for them for the long haul, but it’s hard to find empathy among people who either have not been in a position or have chosen not to go the distance with a loved one who will need more and more caregiving until they die. But you have mine. I pray that God blesses you and keeps you and helps you. Big hugs!